Fragmentation genetics of the grassland butterfly Polyommatus coridon: Stable genetic diversity or extinction debt? Habitat fragmentation can have severe effects on the intraspecific variability of populations and thus plays a pivotal role in species conservation. Especially taxa with specific habitat demands and low dispersal behaviour suffer from habitat fragmentation. One such taxon, the Chalk-hill Blue butterfly, Polyommatus coridon, nowadays mostly occurs in small and isolated, calcareous grasslands across Central Europe. Here we investigate the population genetic structure of 15 local populations of this butterfly species over major parts of the Fränkische Schweiz (south-east Germany). Based on seven polymorphic microsatellites we estimate genetic diversity and differentiation. We use the data to test for potential effects of different habitat sizes, habitat connectivity, and population density. We found high genetic diversity but no significant genetic differentiation among the 15 local populations (F ST = 0.0087, P > 0.05). 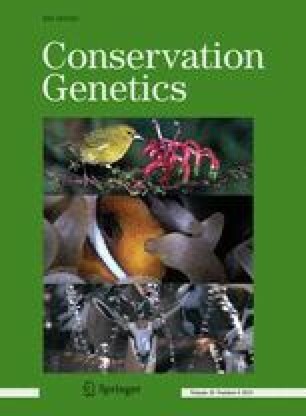 Genetic diversity was not correlated with habitat size, habitat connectivity, or census population size. But, we found a marginally positive correlation between increasing habitat connectivity and population density (r 2 = 0.31, P < 0.05). Compared to other butterfly species, our data resemble a generalist species with well connected populations rather than a specialist taxon existing in a highly fragmented landscape. The high genetic diversity and the lack of differentiation might either be the result of relatively large and stable local populations and ongoing gene flow, or is the genetic legacy of formerly large and interconnected populations during periods of extensive agriculture. The online version of this article (doi: 10.1007/s10592-014-0679-8) contains supplementary material, which is available to authorized users. This project was funded by the EU 6FP project COCONUT, Contract Number 2006-044346 to ISD and JK, and by the EU FP7 SCALES project, project #226852 to ISD and JK. We are grateful for valuable comments on this manuscript by Thomas Schmitt (Müncheberg, Germany) and Emily Martin (Würzburg, Germany). We thank Mike Teucher (Trier, Germany) for generating Fig. 1.